Focusing on all aspects of vertical development projects and their respective sites, this committee serves as liaison between ACEC/NC and multiple owner types and related agencies (including but not limited to higher education institutions, NC Office of State Construction, municipalities, K-12 school districts, healthcare institutions and private industry) and monitors their activities in project planning, design, construction, budgeting and selection of design firms. Focus areas include building construction, site and infrastructure development, code compliance, sustainability and energy conservation. This committee also focuses on economic development activity that affects projects and member firms, with the goal to develop a mutually beneficial relationship between ACEC/NC and economic development organizations such as the North Carolina Economic Developers Association (NCEDA) and raise the visibility and profile of member firms within the economic development community. This committee interacts with various departments and agencies of the State who are involved in environmental activities. Members interact with agency representatives to help improve relationships and assist in promoting environmental policies that benefit both member firms and State agencies. The committee also to monitor and develop an information program on energy/power and private industrial issues. This mirrors a national goal of serving this industry segment and providing value to private and utility sector firms. It will also promote recruitment of these firms to membership in ACEC/NC. 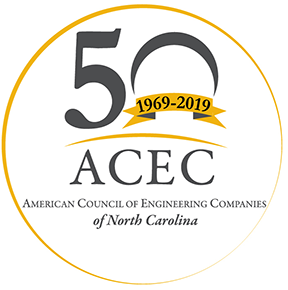 This program seeks to provide young professionals with the broad-based, in-depth industry knowledge they will need in order to rise into leadership positions within ACEC/NC member firms. Future Leaders are nominated annually for this program. This committee monitors State and National legislation that may impact the engineering industry. The committee compiles the Council’s legislative agenda for approval by the Board of Directors and assists in the lobbying efforts to support that agenda. The committee also promotes and organizes events that focus on furthering the Council’s legislative agenda, and supporting our State and National Political Action Committees. This forum serves as a platform for our member firms’ senior leadership to meet and exchange ideas on bettering our business practices with public and private sector clients. In addition, this forum will allow senior members to identify issues that the Board of ACEC/NC should consider focusing on and suggesting action items related to the political process that could be important to the long-term viability of the private engineering industry. Please note that this forum is mindful of anti-collusion requirements and will not discuss those items that could be construed as collusion. This committee serves as a liaison between ACEC/NC and the North Carolina Department of Transportation and other public agencies dealing with all areas of transportation including highways, railways, airports, waterways, mass transit, and other forms of public transportation.